When Silas Jacobson's father dies, and he blames himself for his death, he heads to the Mississippi River to find himself. What he finds is a best friend, a couple of intriguing women, lots of gambling and tons of adventure. He also finds himself in the middle of the Underground Railroad. 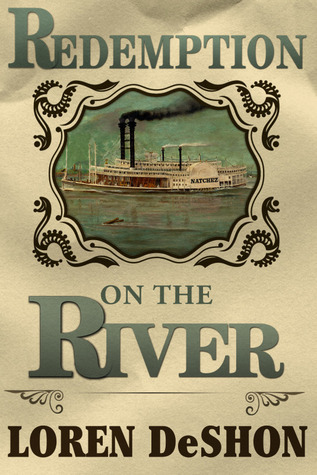 Redemption on the River is Loren DeShon's debut novel, a work of historical fiction that takes us down the Mississippi in the mid-1800s. The historical aspects of the novel are fascinating. I learned so much about life along the Mississippi River, gambling at that time of history ~ I can't believe how much cheating went on ~ and the slave trade during that time. The slavery topic was covered from many angles, from the owners, to the traders, to the abolitionists. The characters were the main focus of this novel. DeShon writes many different characters that really show the different types of people who lived during this time in history. I will admit, I never really liked the main character and narrator, Silas. He had some redeeming qualities, but I felt that he just didn't care enough about anything throughout most of the novel. It was very hard to relate to him. Hannah was much easier to relate to, but she had secrets that weren't revealed until later in the novel ~ although I did figure out her secret much earlier than Silas. Overall, this is an interesting and engaging historical novel, but it's a bit slow and long. While I think everything that happened during the novel happened for a reason, DeShon could have cut a few things out to shorten it a bit. If you like historical novels, especially those that take place during the slave era, I do recommend Redemption on the River. I think you'll enjoy it despite the length. This review was written based on a copy of Redemption on the River that I received from the author in exchange for an honest review.